Vaccines based on live attenuated pathogens have been widely applied to efficiently protect against former epidemics and significantly prolong human life [1, 2, 3]. However, the direct use of live attenuated pathogens in human beings may cause side effects and possible risks. In modern vaccine industry, subunit vaccines have been extensively studied and developed due to their well-defined molecular structure, good safety, specificity, and ease of production and storage. However, they are usually needed to be formulated with adjuvants because of their weak immunogenicity . Many nanomaterials have shown promising vaccine adjuvant potency, which are capable of prolonging the lifetime at injection sites, enhancing cellular uptake by antigen-presenting cells (APCs), promoting lymph node accumulation, and facilitating downstream immune responses of subunit vaccines [5, 6, 7, 8]. Through non-covalent interactions such as hydrophobic interaction, hydrogen bonding, aromatic interaction, and charge interaction, self-assembling peptides and peptide derivatives can self-assemble into nanofibers and hydrogels [9, 10, 11, 12, 13, 14, 15]. These nanofibers and hydrogels have been widely applied for the delivery of therapeutic agents including small molecular pharmaceutics and growth factors [16, 17, 18, 19]. Recent studies also demonstrate that they are promising vaccine adjuvants because of the good biocompatibility, ease of integration of subunit vaccines, and well-defined molecular structures . There are two strategies to apply self-assembling peptides for antigen delivery, one by covalently connecting peptide or protein antigens with self-assembling peptides and the other one by physically interacting antigens with self-assembling peptides. In this tutorial review, we summarize recent progresses in using self-assembling peptides for vaccine development and antibody production. With the development of vaccines, synthetic peptide ligands or epitopes as well as recombinant proteins have been widely used as subunit vaccines. However, the low immunogenicity and fast degradation property of subunit vaccines hinder their clinical applications. Making antigens into larger aggregates beyond single molecules will prolong their in vivo lifetimes and enhance immune response against these antigens . Therefore, nanofibers of self-assembling peptides provide an ideal platform for the delivery of subunit vaccines. Peptide epitopes and protein antigens can be covalently connected with self-assembling peptides, and the resulting conjugates can self-assemble by themselves or co-assemble with self-assembling peptides to form nanofibers. The antigens are displayed at the surface of resulting nanofibers, which will not affect the activity of subunit vaccines. The formation of nanomaterials enhances the lifetime of subunit vaccines. More importantly, strong antibody responses against peptide epitopes or proteins can be achieved specifically after administrating these epitope-bearing nanofibers without additional adjuvants. These self-adjuvanting nanomaterials will be promising vaccine candidates for disease prevention and immunotherapy. Self-assembling peptides are ease to integrate bioactive peptides and small molecules without losing their functions. Collier group conducted pioneering works about using self-assembling peptides to increase the specific antibody production of subunit vaccines . As shown in Fig. 1, Q11 peptide (Ac-QQKFQFQFEQQ-Am) has the ability to self-assemble and form β-sheet-rich nanofibers in saline solution (Fig. 1b). The nanofibers of Q11 possessed a minimal immunogenicity, which held advantages for their applications in regenerative medicines. In their work, they rationally designed and synthesized a self-assembling peptide (O-Q11) containing the Q11 self-assembling domain in tandem with OVA323–339 (a 17-amino acid peptide including known T- and B-cell epitopes from chicken egg ovalbumin, hereinafter referred to as OVA, Fig. 1a). The O-Q11 could also form entangled fibrils with widths of about 15 nm when it was firstly dissolved in water and then added to phosphate-buffered saline (PBS) (Fig. 1d). Circular dichroism (CD) spectra of O-Q11 showed a high degree of β-sheet structure with a concentration-dependent manner similar to the spectra of Q11 (Fig. 1f). Subsequently, they demonstrated the availability of the OVA epitope on the surface of O-Q11 nanofibers by TEM and ELISA. They synthesized biotin-O-Q11 (N-terminally biotinylated O-Q11) and used streptavidin-conjugated gold nanoparticles to probe the epitope availability, showing by streptavidin-gold nanoparticles adhered on the surface of fibrils (Fig. 1e). Besides, according to the results obtained by ELISA, plates coated with O-Q11 fibrils produced similar IgG titers to plates coated with nonfibrillized OVA peptides, which were detected with antisera from immunized with OVA, either with or without complete Freund’s adjuvant (CFA) (Fig. 1g). Surprisingly, after mice being immunized subcutaneously with different peptides, they found a high IgG production elicited by O-Q11 without additional adjuvants in mice due to fibrillization. As shown in Fig. 1h, fibrillized Q11 alone was not immunogenic whether delivered with PBS or CFA. On the contrary, fibrillized O-Q11 without additional adjuvants exhibited similar IgG titers to OVA delivered in CFA. What’s more, O-Q11 delivered in CFA acquired even higher IgG titers (Fig. 1i). The similar production of antibody isotypes between OVA in CFA and fibrillized O-Q11 demonstrated that Q11 peptide itself acted as a powerful adjuvant. O-Q11 antiserum also reacted to OVA-coated plates, indicating the availability of the epitopes on the fibers (Fig. 1j). Yet OVA-specific antibody responses were not elicited after eliminating covalent bonding between Q11 self-assembling domain and OVA epitope domain, demonstrating the self-adjuvant properties of Q11 were entirely dependent on its covalent conjugation to the epitope peptide (Fig. 1k). In general, antibody production resulted from T cell help by producing cytokines or antigen presentation. This study not only demonstrated for the first time peptide epitope-bonding self-assembling peptide could elicited high specific antibody titers but also provided a novel idea for the development of vaccines and clinical application of self-assembling peptides [22, 23]. Nowadays, strategies for either avoiding strong antibody responses or specifically inducing them contribute to use of self-assembling peptides both within tissue engineering and with immunotherapies. Therefore, Collier and co-workers ulteriorly investigated the molecular determinants and immunological mechanisms of OVA-Q11 . They found that the antibody responses to self-assembling peptides were long term. Similar to OVA peptide in CFA, mice immunized with OVA-Q11 produced durable antibody responses at least 1 year, while nonimmunogenic peptide Q11 alone had non-detectable antibody responses all along (Fig. 2b). These durable immune responses were a significant advantage for vaccine development. The epitope-dependent antibody responses were determined by ELISA. OVA-Q11 antisera were used to react with plates coated with various fragments (OVA-Q11, OVA, SGSG-Q11, or Q11). Higher antibody titers were observed in unbroken epitope groups (OVA and OVA-Q11), whereas epitope-missing SGSG-Q11 raised small amount of antibody. Q11-coated plates did not raise any antibody production (Fig. 2c). Thus, they concluded that the antibody responses were directed primarily against the OVA epitope domain. Subsequently they found that the responses to OVA-Q11 were dependent on T cells by using adoptive transfer assays. Before immunization, mice were injected with CFSE-labeled OT-II CD4+ T cells, which recognize specifically the OVA epitope. 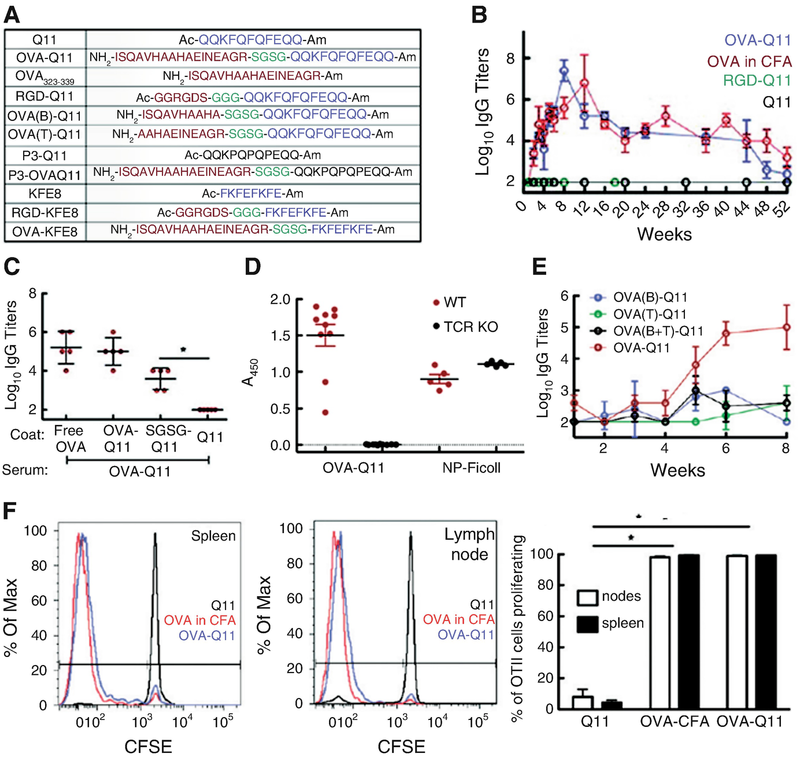 Robust proliferation of OT-II CD4+ T cells was observed in the lymph nodes and spleens of mice immunized with OVA-Q11 and OVA in CFA, while Q11 hardly stimulated these T cells (Fig. 2f). T-cell receptor knockout mice (TCR KO) lost completely antibody responses against OVA-Q11, whereas T-independent antigen NP-Ficoll had not been influenced (Fig. 2d). Strong antibody responses did not raised in mice immunized with both OVA(B)-Q11 contained only the putative B-cell epitope and OVA(T)-Q11 contained only the putative T-cell epitope, making antibody responses adjustable by change epitope regions in antigen domain of peptide (Fig. 2e). Since self-assembling peptides were T-dependent, the means of disrupting the T-cell epitope of OVA-Q11 was effective to abolish immunogenicity. According to these results, immune responses can be modulated purposefully by changing epitope domain and self-assembling domain. The finding is helpful for the clinical translation of self-assembling peptide. Besides short peptide antigens, Collier group also integrated multiple functional proteins into self-assembling peptide nanofibers as vaccines . These designed fusion proteins contained a β-sheet fibrillizing peptide tail (βTail) that allowed proteins being expressed and purified in a soluble form. When mixing with additional β-sheet fibrillizing peptide Q11 (QQKFQFQFEQQ), these βTail fused proteins could co-assemble with the Q11 peptide into nanofibers (Fig. 3a). Using this strategy, they constructed a fusion protein (βT-GFP) based on the green fluorescent protein (GFP) and βTail peptide (MALKVELEKLKSELVVLHSELHKLKSEL). Q11 could rapidly fold into β-sheet nanofibers at physiologic condition, while βTail slowly transformed from α-helix to β-sheet conformation upon mixing with Q11 to form mixed component nanofibers (Fig. 3b, c). Moreover, the fungal enzyme cutinase fused with βTail (βTail-cutinase, βT-cut) could also be integrated into Q11 peptide nanofibers. The fusion with βTail and the co-assembly process would not dramatically affect the enzyme activity. Subsequently, they explored the immune responses induced by fibrillized protein antigens. Fibrillized βT-GFP or βT-cut elicited higher antibody titers than soluble antigen (βT-GFP/βT-cut and βTmut-GFP unable to co-assemble with Q11) (Fig. 3d). These supramolecular nanofibers could also be utilized as multi-antigen vaccines. Vaccines based on Q11 nanofibers bearing both βT-GFP and βT-cut elicited a higher anti-cutinase antibody production than the soluble form. However both fibrillized and soluble βT-GFP groups received low titers of anti-GFP antibodies (Fig. 3e, left), probably due to preferential immunological responses to cutinase than GFP. An additional administration of fibrillized βT-GFP enhanced its antigenic dominance and higher GFP-reactive antibody titers were thus detected (Fig. 3e, right). The co-assembly of multiple fusion proteins into nanofibers promotes specific antibody production, which provides a novel strategy for the development of protein vaccines for disease prevention and immunotherapy. Using this strategy, the number of immunizations would be minimized when facing with multiple different antigens from a single pathogen or multiple. Peptide amphiphile (PA) consists of a hydrophobic, lipid-like tail linked to a hydrophilic, biofunctional peptide headgroup. Under aqueous conditions, the PAs self-assemble into tubular structures with high density of peptide epitopes on their surface . The formation of self-assembled nanostructures will also enhance the stability of peptides, and therefore PAs are also ideal for antigen delivery. Many PAs (also called lipopeptides) have demonstrated to be effective self-adjuvanting vaccines that act by stimulating the toll-like receptor 2 (TLR2) on DCs . To rule out the TLR2 activation for evaluation of the efficacy of PA itself in antigen delivery, Tirrell group rationally designed a PA containing a hydrophobic dialkyl tail with two palmitic chains (diC16) that would not stimulate TLR2 and induce DC maturation . The OVA peptide (EQLESIINFEKLTE) containing the known cytotoxic T-cell epitope (ESIINFEKL) can be covalently conjugated to diC16 to afford diC16-OVA (Fig. 4a). DiC16-OVA amphiphile could self-assemble into cylindrical micelles with length of 50–500 nm (Fig. 4b, c). The half lifetime of dissociation of PA from the micelles was about 38 h in vitro. Since nanoparticles could reach lymph nodes within 1–2 h of injection and DCs could migrate from the site of vaccination to the lymph nodes within 24 h , the micelles provided enough time for their therapeutic function. To evaluate the potency of diC16-OVA micelles acting as antigen delivery vehicles in vivo, a preventive immune assay was performed. After three subcutaneous immunizations with phosphate buffer saline (PBS), diC16-OVA in PBS, and OVA peptide in incomplete Freund’s adjuvant (IFA), female C57BL/6 mice were inoculated with cancer cells expressing ovalbumin. Slower tumor growth and longer survival rate were received in the diC16-OVA group compared to PBS group and OVA in IFA group (Fig. 4d, e). The tumor prevention in diC16-OVA group was mediated by OVA-specific cytotoxic T cells. As shown in Fig. 4f, there was more splenocytes stained with fluorescently labeled MHC-I pentamer loaded with the SIINFEKL peptide obtained from the diC16-OVA group compared to those obtained from PBS and OVA in IFA groups. As an effective antigenic peptide delivery system, self-assembling PAs containing T-cell epitope will be doubtlessly an excellent cancer vaccine candidate. Until now, there are only two FDA-approved vaccine adjuvants, aluminum salts (alum) and the recently approved monophosphoryl lipid A (MPL). 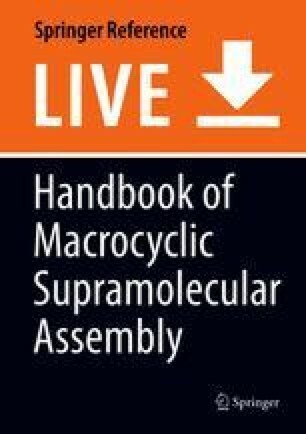 MPL is an amphiphilic molecule derived from lipopolysaccharide (LPS). It can form vesicles, and antigens should be encapsulated into the formed vesicles for functions. Alum is gel-like material that can provide porous cavities for antigen adsorption by simple mixing. Nanomaterials with the size of 20–200 nm carrying antigens can move from draining lymphatic capillary to lymph nodes to stimulate immune responses. Therefore, many nanomaterials including MPL and abovementioned ones are very useful vaccine adjuvants especially for the development of vaccines to treat cancers, HIV, etc. Though alum cannot elicit strong cellular immune response and it can only be applied for the development of prophylactic vaccines, it attracts extensive research interests to develop adjuvants similar to alum because of the ease of formulation in large scales. Hydrogels are promising materials for this goal . For example, a whole-cell vaccine can be obtained by physically mixing attenuated cancer cells with injectable cryogel for cancer therapy . In the following section, we introduce using supramolecular nanofibers/hydrogels formed by self-assembling peptides to physically interact with and deliver antigens. DNA that encodes tumor-specific antigens represents potential immunostimulatory agents. However, rapid enzymatic degradation and mechanical fragmentation from high shear stresses during injection restricted its development. In general, DNA vaccines must be injected with a delivery system to enhance their immune responses. Therefore, developing a high-efficient DNA delivery system was regarded as an urgent requirement. Self-assembling peptides became a popular supramolecular material for biomedical applications in the last two decades not only because of its security but also its ease of design and modification. Self-assembling peptides rich in lysine, arginine, and histidine behave positive charge and are able to catch the negative charged DNA in hydrogels. 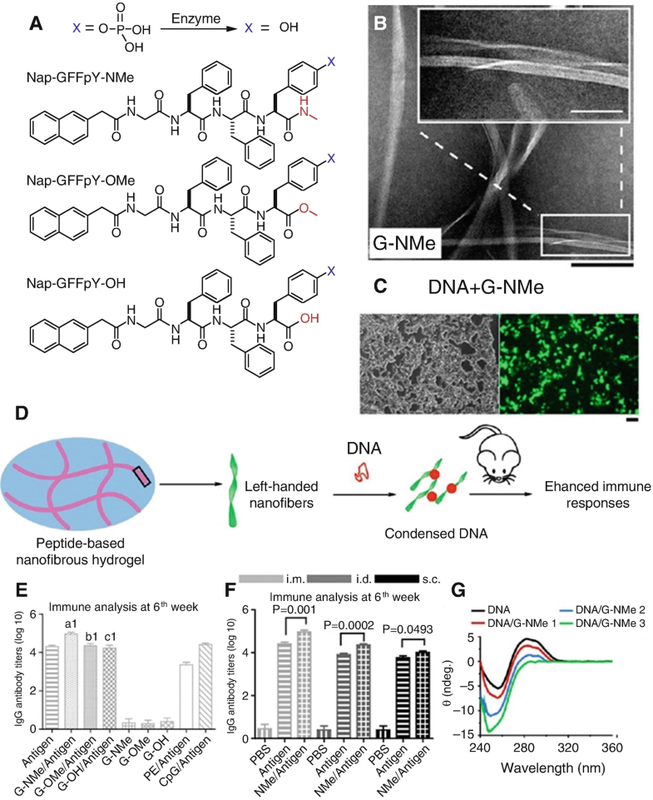 Besides the sustained release and protective effect of DNA in hydrogels, the nanostructures in hydrogels (mostly nanofibers) facilitate the cell internalization of DNA via endocytosis, thus enhancing DNA delivery efficacy and facilitating immune responses. Scott H. Medina and co-workers have conducted a pioneer work on using DNA-encapsulated peptide hydrogels for DNA vaccine development . Hydrogels were prepared by increasing the ionic strength of the peptide solution (Fig. 5a). Three peptides MAX1, MAX8, and HLT2 characterized by formal charge of +9, +7, and +5 at neutral pH were utilized to prepare DNA-loading hydrogels. Gels loaded with DNA(TA), encoding for a melanoma-specific gp100 antigen fused to the alarmin protein adjuvant HMGN1, were submerged in saline to measure the DNA retention ability over a 2-week period. The results indicated that DNA could be retained in the gels over 2 weeks (Fig. 5b). Gels loaded with DNA(TA) were then inoculated to mice into the left and right dorsal flanks twice on the day 1 and day 8, respectively. On the day 28, inguinal lymph nodes of mice were removed to evaluate the lymphoproliferative response using a thymidine incorporation assay. Compared with mice with subcutaneous administration of naked DNA(TA) and gels without DNA, mice inoculated with MAX8 and HLT2 hydrogels containing the DNA(TA) show 3–4 times increase of the ex vivo lymphocyte proliferation (Fig. 5c). The data primarily confirmed the immunostimulatory potential of MAX8 gel and HLT2 gel. It’s well known that the alarmin portion of the HMGN1-gp100 fusion induced Th1-mediated activity. The ability of the DNA(TA)-loaded gel to facilitate an immune response mediated by CD4+/IFNγ+ expressing Th1 cells was next to be investigated. Figure 5d showed a higher percentage of CD4+/IFNγ+ cells in the draining lymph nodes of mice inoculated with DNA(TA)-loaded HLT2 gels than those inoculated with naked DNA. Higher gp100-specific antibodies were detected in the sera of mice immunized with the HLT2 gel with DNA(TA) vector than those immunized with the HLT2 gel with the control DNA(−) (an empty plasmid vector) or only DNA(TA) vector with the gel (Fig. 5e). Their study clearly showed that DNA-loaded HTL2 hydrogels were promising as immunostimulatory materials. Jiang and co-workers also used peptide hydrogel to deliver DNA vaccines for potential HIV treatment . Unlike Medina’s strategy that using the peptide hydrogel as a physical carrier, they used a co-assembly strategy. 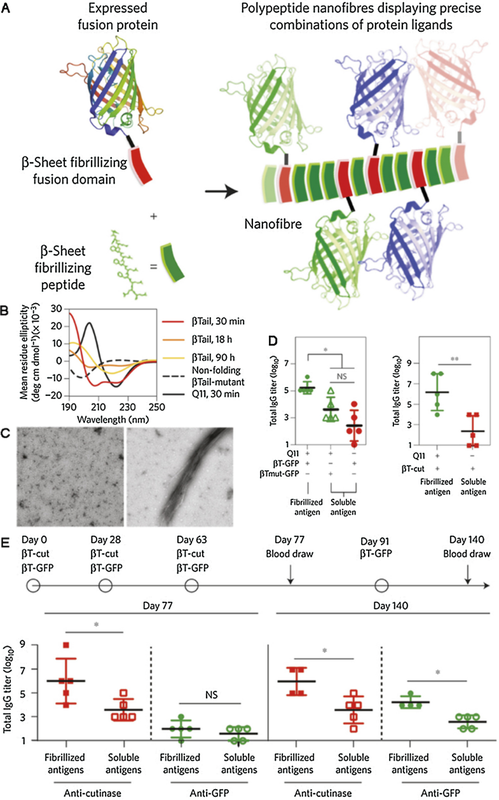 The phosphorylated precursor of self-assembling peptide, Nap-GFFpY-NMe, could be converted by the enzyme of phosphatase to Nap-GFFY-NMe that could self-assemble into nanofibers and hydrogels (G-NMe, Fig. 6a). During the conversion, Nap-GFFY-NMe could interact with DNA molecules and then condensed DNA into co-assembled nanomaterials (Fig. 6d). Control gels with different terminal groups were also constructed (G-OMe with methyl ester terminal group and G-OH with carboxylic acid terminal group). The G-NMe/antigen significantly enhanced antibody titer of HIV Env DNA (DNA encoding the HIV-1 envelope protein gp145) via the immunization by intramuscular (i.m. ), intradermal (i.d. ), or subcutaneous (s.c.) injection (Fig. 6e), while the two control gels showed similar antibody titers to the group received only DNA antigen. IFN-γ secreting from lymphocytes also increased 3-foldin G-NMe/antigen group compared with that in antigen group. They also used enzyme-linked immunospot assay (ELISPOT) to determine the levels of IL-4 and IFN-γ to comprehensively evaluate the cellular immune responses. They found that HIV DNA vaccine with G-NMe significantly augmented numbers of lymphocytes that secret IL-4 and IFN-γ compared with naked DNA alone (Fig. 6f). Taken together, these data showed that G-NMe could induce both humoral and cellular immune responses via multiple routes of injection, including i.m., i.d., and s.c. The enhanced immunity by G-NMe probably resulted from the left-handed nanofibers in the gel (Fig. 6b, g) that could condense DNA and promote the entry of DNA into mammalian cells (Fig. 6c). In addition, this nanovector could be metabolized gradually in the body within 3 weeks. The study suggested that the Nap-GFFY-NMe nanovector provided a safe, straightforward, and effective approach for HIV DNA vaccine. In Jiang’s report, G-OMe formed by treating Nap-GFFpY-OMe with phosphatase was not effective for HIV DNA vaccine. 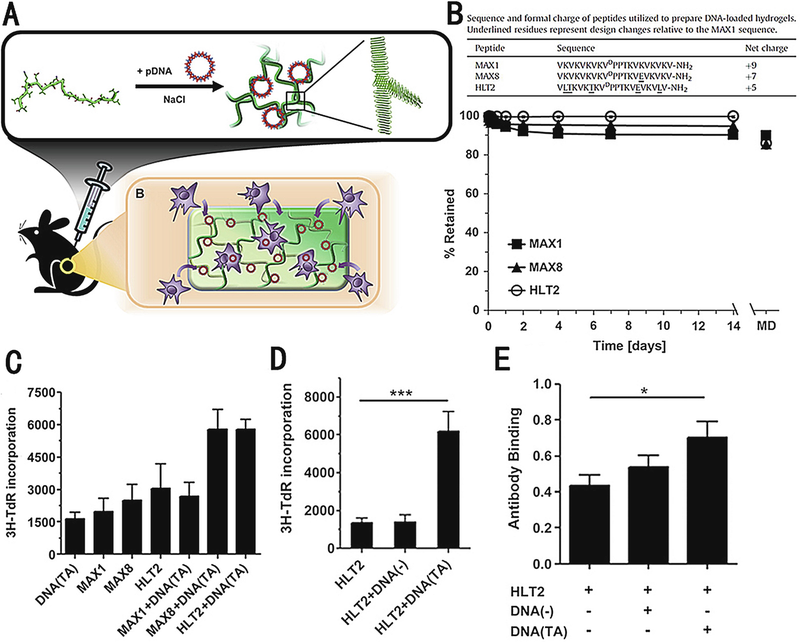 Yang and co-workers subsequently found that it was useful for protein vaccine development, especially for its D-counterpart (gel formed by treating Nap-GDFDFDpY-OMe with phosphatase, Fig. 7a) . Ovalbumin (OVA) was used as the model protein for the study. 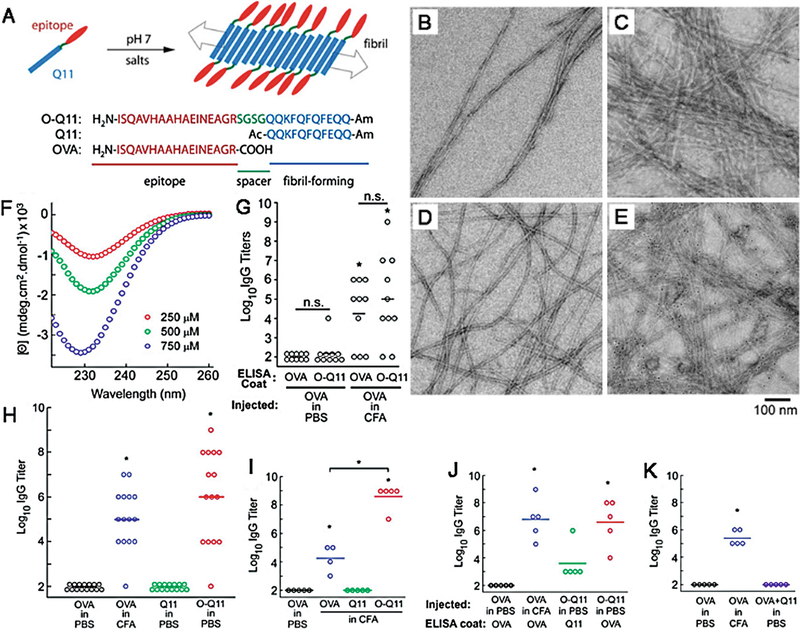 In the presence of OVA protein, Nap-GFFpY-OMe or Nap-GDFDFDpY-OMe could still form nanofibers in hydrogels (L-gel-2 and D-gel-2) by alkaline phosphatase (ALP) (Fig. 7b, c). 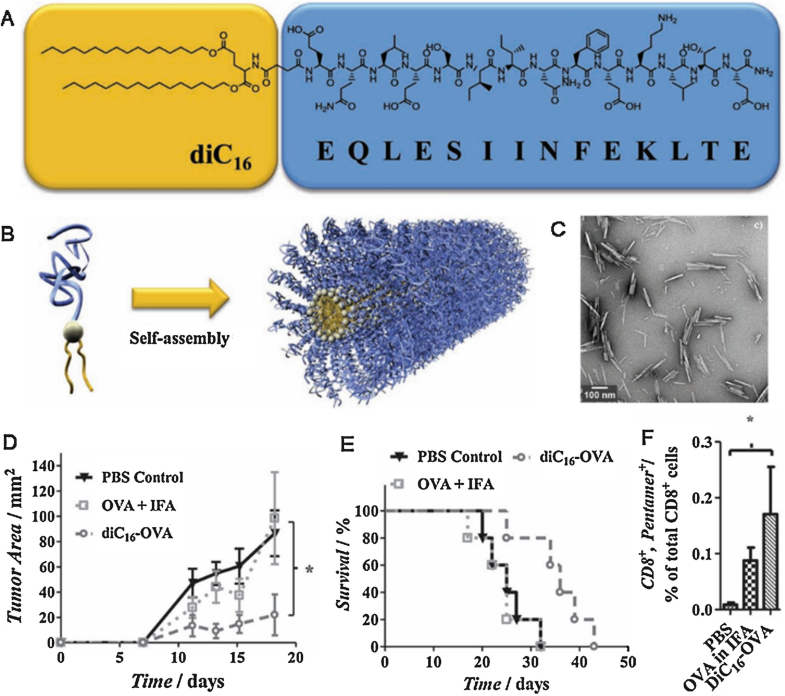 After the resulting nanofibers being separated by centrifugation, the results obtained by SDS-PAGE indicated that most of OVA were in the nanofiber deposits, suggesting the co-assembly of the self-assembling peptides with OVA protein. C57BL/6J mice were then immunized subcutaneously with different hydrogel-based vaccines, and soluble OVA in PBS was used as a control while the alum-adjuvant-containing OVA as a positive control. Compared with soluble OVA group, alum evoked 163-fold of IgG antibody, while L-gel-2 and D-gel-2 stimulated higher IgG antibody production than alum (209- and 622-fold, respectively, Fig. 7d). Both gels can enhance antigen uptake (Fig. 7e) and promote and prolong accumulation of antigen in lymph nodes (Fig. 7f), as well as evoke germinal center formation. They also demonstrated the capability of hydrogels to promote DC maturation. BMDCs treated with both gels showed significantly enhanced expression of CD80, which were the co-stimulatory molecules of DCs (Fig. 7g). The D-gel significantly promoted the expression of CD40 on BMDCs, while L-gel only slightly increased its expression (Fig. 7h). 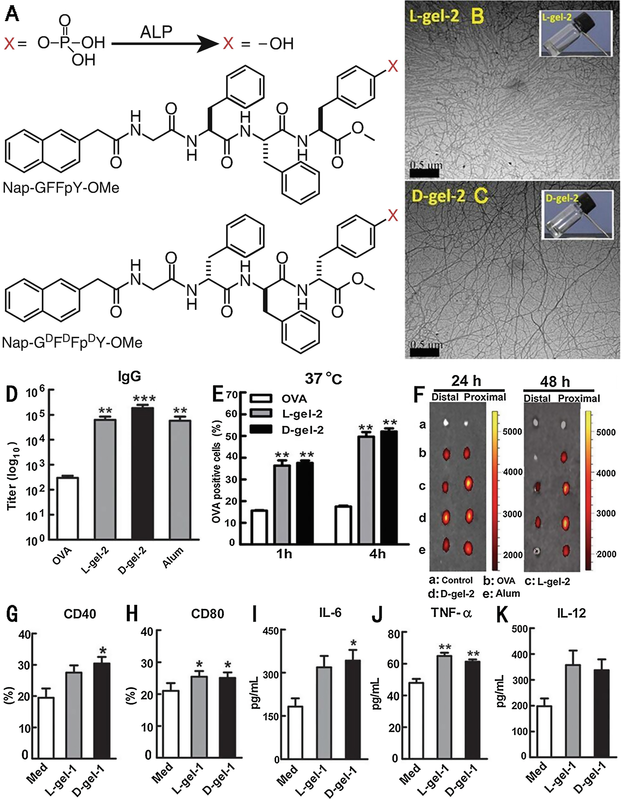 In addition, both gels significantly induced TNF-α production (Fig. 7i), while D-gel but not L-gel significantly promoted IL-6 production (Fig. 7j). Furthermore, both gels moderately induced IL-12 secretion by BMDCs (Fig. 7k). In a therapeutic tumor inhibition assay, D-gel-2 prevented EG-7-OVA tumor growth more significantly than its L-counterpart. These observations suggested that D-gel was more powerful to stimulate CD8+ T-cell response. 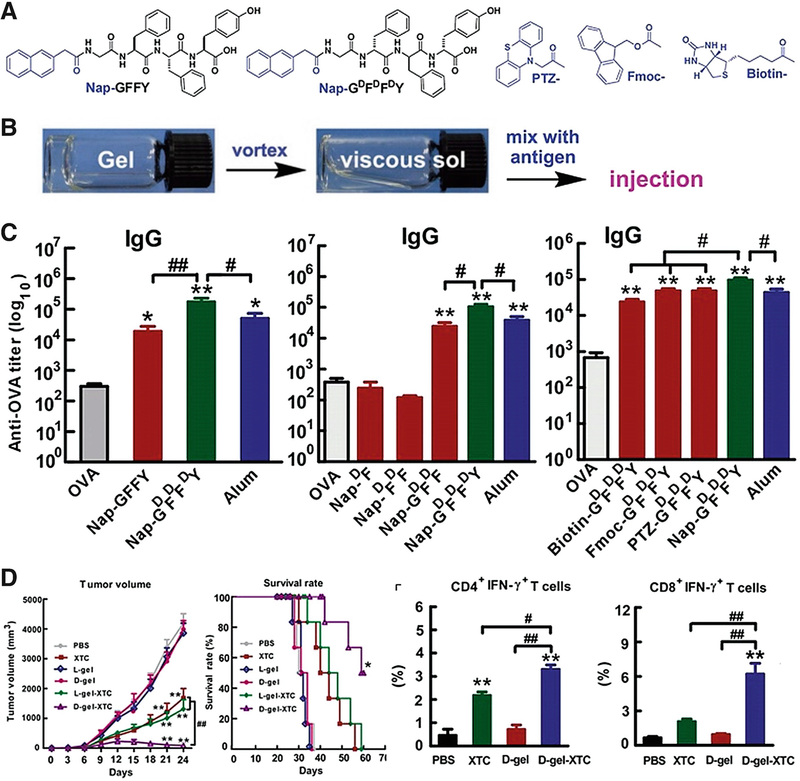 The good biocompatibility of the gels and more powerful cellular immune response eliciting property of D-gel suggested its potential in the development of protein vaccines to treat cancers. The cellular immune response, especially the CD8+ T-cell immune response, is important for immunotherapy because the CD8+ T-cell immune response is an immune process that can directly kill bacteria, viruses, and tumor cells . Jiang, Yang, and co-workers have demonstrated that self-assembling peptides could form co-assembled nanofibers for vaccine delivery to evoke the cellular immune response [33, 34]. However, it is difficult to obtain the pro-gelator (Nap-GFFpY-NMe or Nap-GFFpY-OMe) in large scales (e.g., grams). Besides, recent studies have indicated that the pathway to prepare supramolecular hydrogels is very important to the property of resulting gels . Therefore, the kinetics of enzyme reaction may affect the vaccine adjuvant property of resulting gels. It is therefore worth investigating the vaccine adjuvant property of hydrogels formed by the general heating–cooling process. Therefore, Yang and co-workers recently tested the vaccine adjuvant property of a serial of hydrogels formed by heating–cooling process . The model protein antigen, ovalbumin (OVA), could be easily incorporated into hydrogels through the vortex (Fig. 8b), which could be used for subcutaneous immunization of C57BL/6J mice. They found that the gel based on a D-tetra-peptide (Nap-GDFDFDY) was the most powerful one to raise antibody titer. As shown in Fig. 8c, the gel of Nap-GDFDFDY increased anti-OVA IgG titer by 580-fold, while the one of its L-counterpart increased only 60-fold. Replacing Nap- with other aromatic capping groups (PTZ-, Biotin-, Fmoc-, etc.) and shortening the D-tetra-peptide (DFDFDY, GDFDF, DFDF, and DF) would significantly decrease the adjuvant property (Fig. 8a, c), highlighting the significance of the peptide sequence and Nap- capping group. They used X-ray-treated E.G7 tumor cells as the antigen and tested the vaccine adjuvant potency of the gel formed by Nap-GDFDFDY (D-gel). As shown in Fig. 8d, the vaccine significantly inhibited tumor growth and prolonged survival time of tumor-bearing mice, compared to other vaccines. The result suggested D-gel was a powerful adjuvant for both protein and attenuated tumor cell antigens. Mice immunized with D-gel-XTC showed a significant increase in CD8+ IFN-γ+ T cells and a moderate increase in CD4+ IFN-γ+ T cells compared with those in the other groups, suggesting the potent ability of D-gel to stimulate CD8+ T-cell responses (Fig. 8e). The peptide Nap-GDFDFDY could be synthesized in a 10 gram scale through standard Fmoc-solid phase peptide synthesis and purified by recrystallization from aqueous ethanol, and the gel could form via an autoclave procedure. Their study provided a versatile and promising hydrogel-based vaccine adjuvant for practical applications. Predominant studies concern about using self-assembling nanofibers to enhance the immune response of antigens. While the immunotherapy of diseases induced by hypersensitivity, such as systemic lupus erythematosus and rheumatoid arthritis, remains as a challenge, in order to treat these diseases, immunosuppressive reagents are necessary. There are large amounts of natural antibodies in human being against small molecular carbohydrates including α-Gal epitope (Gal-α(1,3)-Gal-β(1,4)GlcNAc/Glc) and L-rhamnose (Rha) . Recruitment of these natural antibodies has become an important strategy for vaccine design. Surprisingly, Xu and co-workers found that self-assembling nanofiber based on a L-rhamnose-modified peptide (Fig. 9a, b) could suppress the antibody response of mice to phycoerythrin (PE), a fluorescent protein antigen . They synthesized self-assembling peptides with L-rhamnose (1 in Fig. 9b) and without L-rhamnose as the control (5 in Fig. 9b). Both compounds formed hydrogels with uniform nanofibrils (Fig. 9c). They immunized mice with PE antigen and hydrogels as adjuvants. Extra purified human IgM was also injected before the immunization due to the low levels of anti-rhamnose antibodies in mice. The results indicated a reduced antibody response to PE in the mice pre-injected with purified human IgM following with the immunization of PE encapsulated in the gel formed by 1 (Fig. 9d). There were no obvious antibody reductions when replacing gel of 1 with gel of 5 or without the pre-injection of purified human IgM (Fig. 9d), suggesting the importance of self-assembled rhamnose and IgM. The strategy of using supramolecular assemblies of a saccharide to suppress immunity provided a novel approach for immunomodulation. 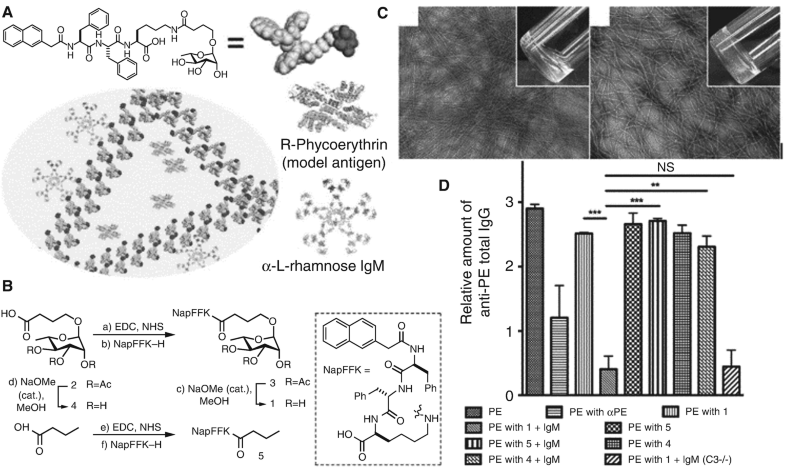 The pioneering works introduced in this tutorial review have demonstrated that self-assembling peptides are powerful nanomaterials for immune modulation, which are very useful for vaccine development and antibody production. However, challenges still remained as formidable tasks. Peptides and proteins are needed to be folded into correct conformation to stimulate specific antibody . While nanomaterials formed by self-assembling peptides are metastable materials [41, 42], their property will be significantly affected by the pathway of preparation [36, 43, 44]. In order to assist peptide folding, the kinetics of peptide self-assembly, pathway to prepare self-assembled nanomaterials, and presence of additives are needed to be screened and optimized. For antibody production, complete Freund’s adjuvant is very powerful but is still unable to enhance the proportion of specialized antibody for phosphorylated and acetylated proteins. Self-assembling peptides may prevent the dephosphorylation and deacetylation of the antigens and therefore specifically evoke antibody production for these proteins. Besides, a perfect mixed of multiple adjuvants may further increase the efficiency of antibody production . Combination therapy will generally lead to better therapeutic effects for cancer treatment. The effect of combination of cancer vaccine with chemotherapy, cell therapy, or other immunotherapy on cancer treatment is worth investigating. Though many challenges remained, we image a brilliant future of self-assembling peptides in the development of novel vaccines and peptide-based therapeutics.